Hi, my name is Rubio Medina and I run a Futurama fan site called A Big Piece of Garbage which has information about the show, merchandising and anything else I feel like sharing with everyone else. Along with running my own site I am also an administrator at a Futurama message board called the Futurama Foundation. We are a fairly new community but are fairly active with discussions on the show, trivia, games and of course Futurama merchandise. I have been a fan of the show for some time now and probably like most of you am saddened to see that it will be going off the air after this season. As not only being an animated program but one set in the future there is plenty of opportunity for merchandise based off characters and other aspects of the show. Matt Groening had said when the show started that there would be plenty of stuff based off of the show to come out and over the last couple of years they certainly have not disappointed. All in all they have went with small companies and dealt with primarily specialty type vendors and they have all offered unique items. One such vendor is Rocket USA. 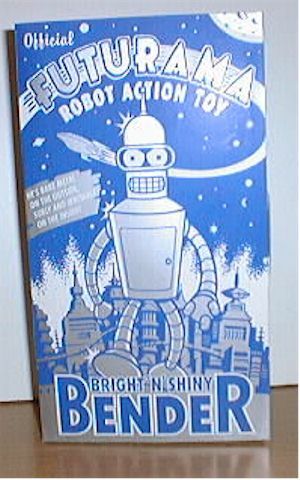 Makers of fine tin toys for years they were one of the first to jump on the Futurama bandwagon and have produced not only a great set of walking tin toys but die cast figures of the entire Planet Express crew and the forthcoming Zapp Brannigan Space Gun. An item that Matt Groening promised before the show debuted and one that I am looking forward to. 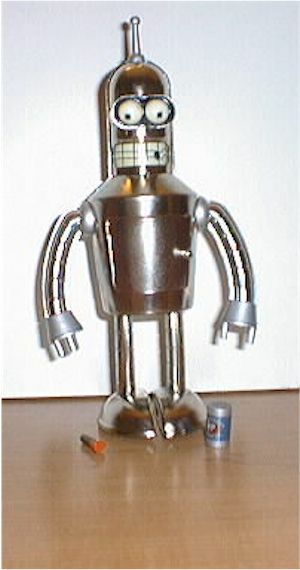 For this review I have decided to take a look at a variant that RocketUSA made based off of their popular Bender walking tin toy - the Shiny Metal Bender. I will do my best to stay unbiased in my look at this and try and remember that not everybody out there is as crazy over Futurama as I am. 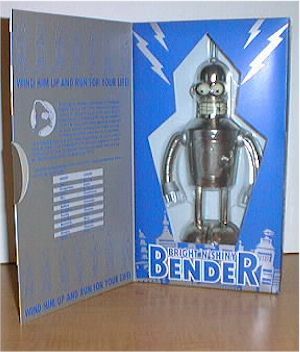 RocketUSA has always done a great job on packaging and the shiny Bender is no different even if it is based off of the same packaging as the original walking Bender. The packaging has a very retro feel to it as there are only two colors used on it. It is really nice to look at. The other area where they get high marks is for making it extremely collector friendly. 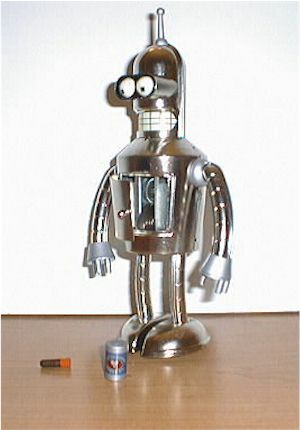 Bender can be removed without damaging the packaging at all. RocketUSA uses a series of plastic slip covers to hold the figures in place and a piece of tape for the accessories and the turn key. The only ding against the packaging revolves around the cardboard used in the box. It is a little flimsy and would have been nice if it was more sturdy and rigid. The box can be easily damaged if you are not careful with it. How hard can it be to sculpt Bender the robot? The proportions all look really good and is a really great representation of Bender. The hands even hold the accessories with no problem and as an added bonus Bender comes with two different mouth expressions. One is his standard mouth and through a turn of his antennae it reveals a different mouth which the included cigar fits nicely into. This is a really nice touch I think. The other little nice feature is that Bender's door is operational. You can open it and see all the gears at work that make him walk. These two features really help to bump this score up as it shows RocketUSA going that extra step to make something worthwhile and fun. Being bare metal you would think there is no paint that was applied to the figure and I really can't tell if there is or not. One thing for sure is that there is no sign of the rippling that my other two Bender's suffer from as the shiny Bender is crisp and clean from head to toe. A note about the painting on this - according to the liner notes penned by Hubert J. Farnsworth himself this is really a type of mood metal called moodium that changes colors based off of your robots emotions at a particular time. There is a handy chart included so that you can decipher exactly what your robot is feeling as he changes color with his moods. Reading it reveals how little Bender's mood changes and again is a nice little detail that Rocket USA has added in an effort to go that extra mile. I would like to see him be able to walk longer distances on wind-up or be able to cover more ground with each step but considering the mechanism that is used to propel Bender it is a minor complaint. Since the mechanism is wind-up you can only turn it so far and then let him go. Maybe another feature that could have been added would be to have his head rotate around much like in the episode the Cryonic Woman. That being said I was a little on the fence about whether this should be a ** 1/2 score or a ***. I went with the ** 1/2 because it was more important that he be able to walk longer distances on a single wind-up. That and the fact that I don't know too much about other wind-up toys and so don't have a good reference as to what is acceptable and what is not with these toys. Accessories is a little hard to judge as Bender does come with some sculpted pieces that are both useful and show specific. 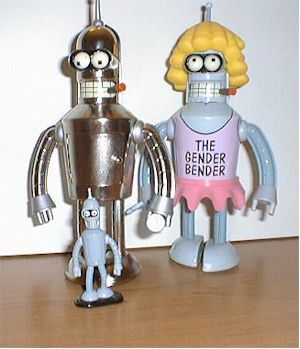 These include a can of Mom's Old Fashioned Robot Oil and Bender's ever present cigar. The packaging itself contains some cutout accessories on the back of the box that could also be used but certainly are not as fun as the sculpted ones. The reason for the lower score is that I only consider the robot oil and cigar accessories and both of those are pretty small. could be a reason for this requirement. Overall another good toy from Rocket USA. Is it worth it to have another Bender that is not show specific? Unless you are a die-hard collector like myself probably not. Much like the MAC figures the variant Bender I would love to have seen which is not really a variant at all would have been Flexo. However, as a variant on the original Bender this is not too bad. For some reason whenever I look at it I am reminded of Anthology of Interest I where Bender wishes he were 50 feet tall and all of those little bender robots are putting him together. The shiny metal Bender reminds me of all those worker benders. Still, depending on the price you paid for him and the lack of accessories that come with him it knocks the score down a half star. 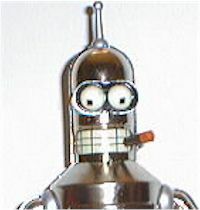 If you are really into Futurama or got him for a really good price bump it back up to a full three stars and enjoy the shiny metal Bender on the shelf with all the other great stuff from Rocket USA!